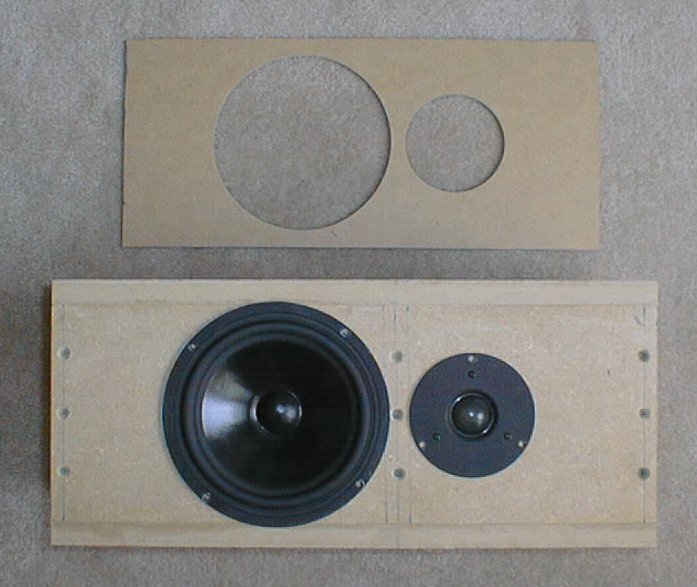 Ultimately I wanted my center channel to match all the speakers I'm currently working on, so I decided I'd better get cracking on a design soon. So today I spent some time cutting and drilling and, well this is what I came up with. I will be using my same exact drivers from my old center channel. 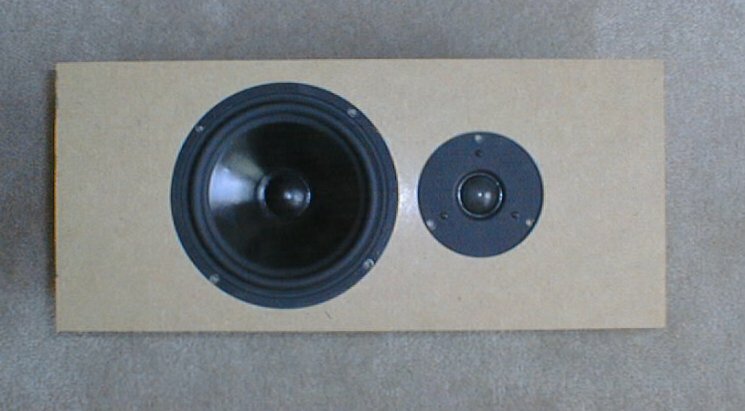 Which consists of a 6.5" Vifa M17SG-09-08 shielded woofer and Morel's DMS-29 shielded 1-1/8" soft dome tweeter. I love the way these two drivers sound together. I believe they are a very good match and have enjoyed their performance over the last year I have been using them. I recently upgraded the cheap 1st order filter with an L-R 2nd order filter and lowered the crossover point to just above 2KHz. There is also a Zobel network on the woofer and was calculated from standard Zobel equations. Now their response is even better than before. Vocals sound natural and uncolored. Upper midrange is clear and blends well with the lower end of the tweeter. I've never had any complaints...except that the enclosure was ugly as all sin. So that's what I'm determined to fix. Here are the first few pictures. More details will follow. Okay now it's time for the details that follow. 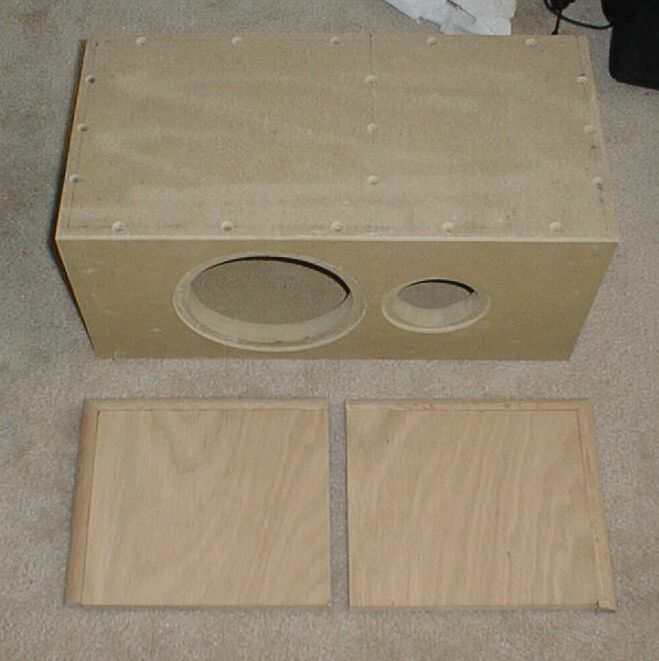 As you can see from the pictures to the right, the speaker is almost to final completion. When I first started this page only 1 week ago, I only had 4 pictures posted. Now I've got about 30 pictures and it's almost totally done and ready to sit on my entertainment center. 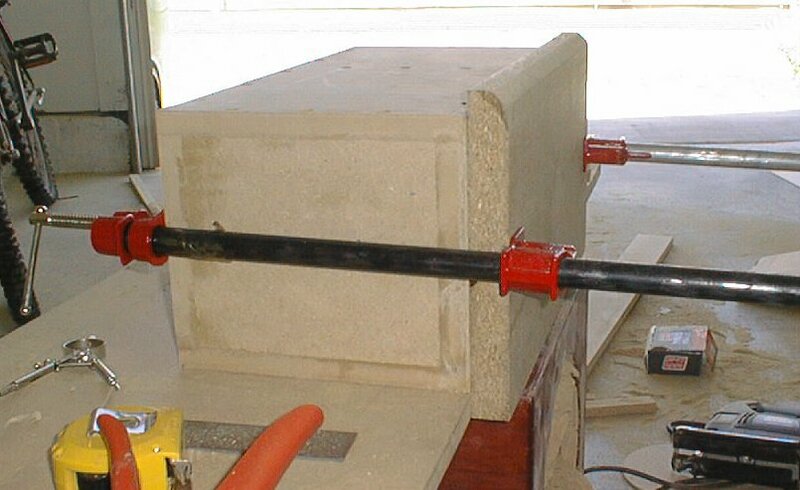 I haven't explained in any detail any part of the building process on this speaker. I suppose that's what this whole web site is suppose to do! 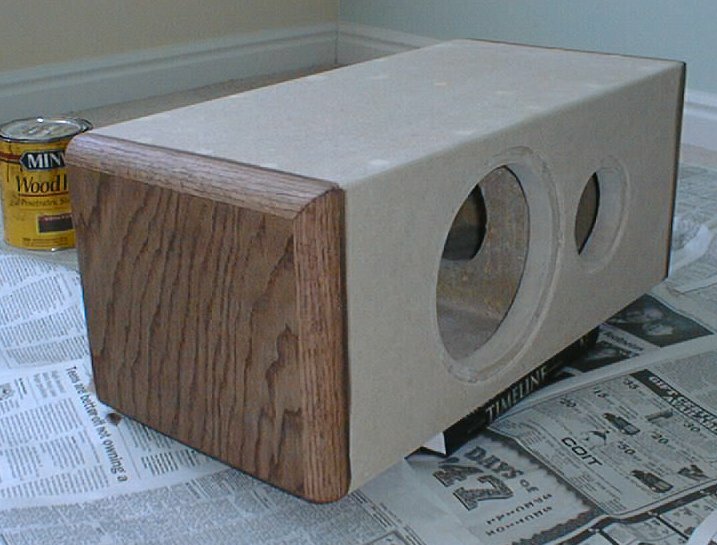 But I will explain a little bit about how I have achieved the final look on this new center channel speaker just in case someone decides they actually do like the way it looks and wants to replicate it. Now most of the pictures speak for themselves. But I'll walk through some of the procedures taken and tools required to accomplish it. 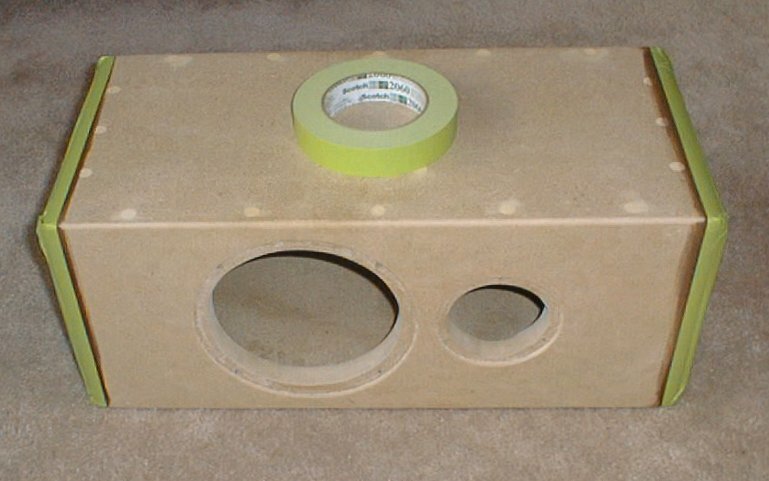 The first thing I did was build a plain, ugly rectangular MDF box. There is nothing fancy about the enclosure in any way. 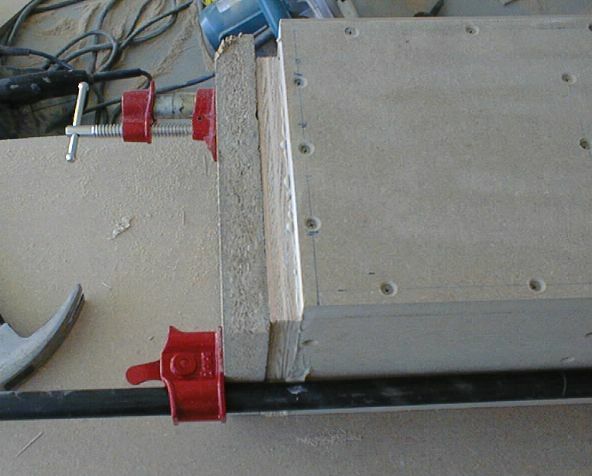 All the cuts were made with a circular saw and a poor-man's-table-saw rig. 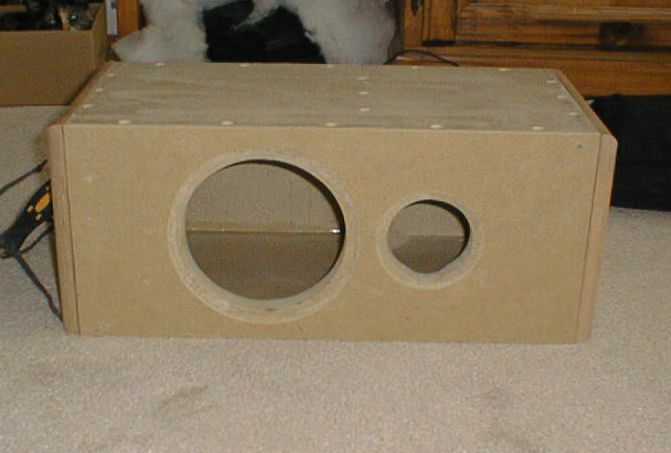 I put a standard shelf brace between the woofer and tweeter for added strength and support to the front baffle. I cut the holes with a B&D jigsaw. Not even an expensive one. Probably the cheapest you find at Home Depot - around $30.00. 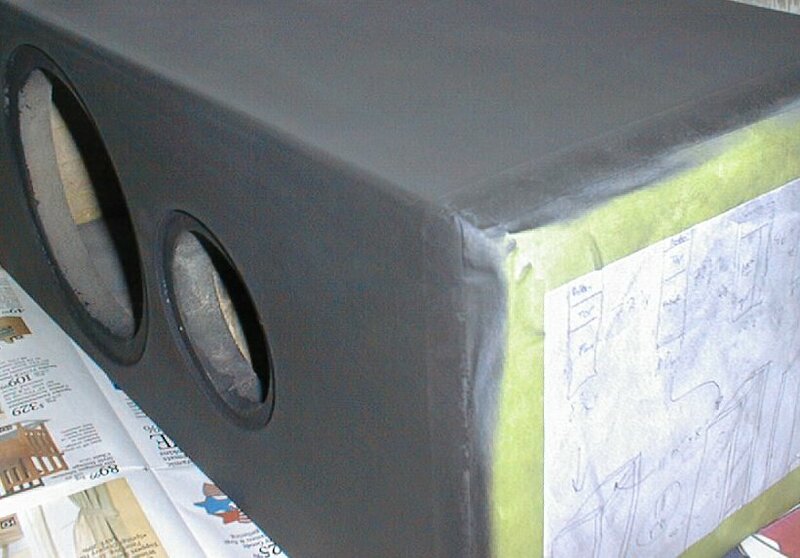 Who says you need expensive tools to build great speakers? You don't! But what I used was a good compass, to draw the circles where I wanted the drivers to be located. Then I very carefully and slowly, cut the driver holes. Now I usually try and cut the holes exactly the right size the first time, but if there's any mistaking in the cut, I try to make it smaller, and not bigger. Then I just use some course sandpaper or a course tooth file and shave off any excess until the drivers drop right in. Now the next trick is the flush mounting of the drivers. Once again here's a trick for those of you who don't have a router. Besides, it's just one more expensive tool you don't really need (but I sure do want one!). I call it the flushed-baffle board. 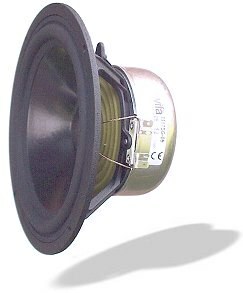 In order to flush mount both drivers exactly, and I mean totally exactly, you need to use a flushed-baffle board that is the same depth as the thickest gasket on your drivers. 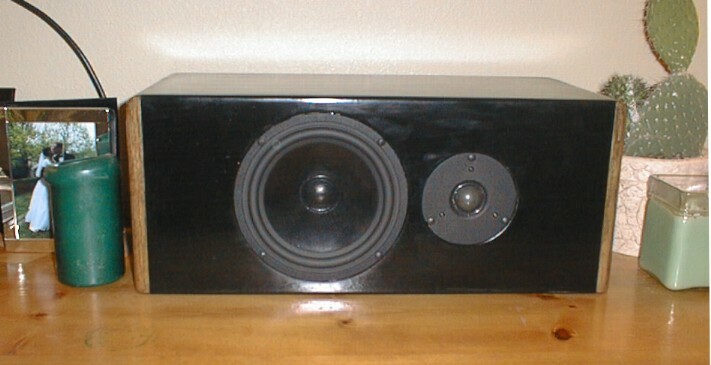 The Vifa woofer was 3/16" thick and the tweeter was just over 1/16". 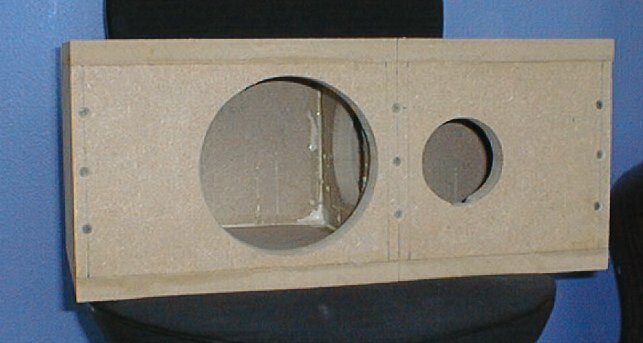 Ideally I should have used a 1/4" flushed-baffle board, and then raised the woofer 1/16" by using extra thick weather stripping. The tweeter I could have done the same as used super extra thick weather stripping, or made a 1/16" ring to fit inside the hole and then used some thick weather stripping. Well that seemed too complicated and I didn't want all my drivers sitting on 2" of weather stripping (to exaggerate a little). 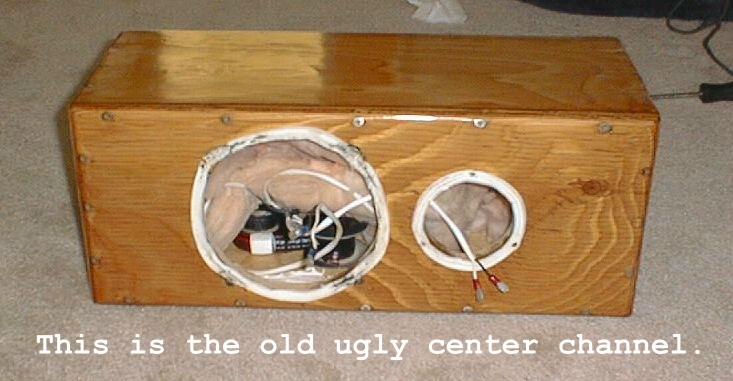 Not only that, but the drivers should be mounted as firmly and as closely as possible to the enclosure baffle to help eliminate basket ringing or other resonant effects the the drivers may exhibit if given too much play against the baffle they're bolted to. 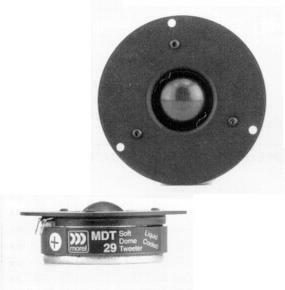 With the tweeter, it's not as big an issue, because the moving force of the dome is so minute compared to the weight of its faceplate and surrounding structure. 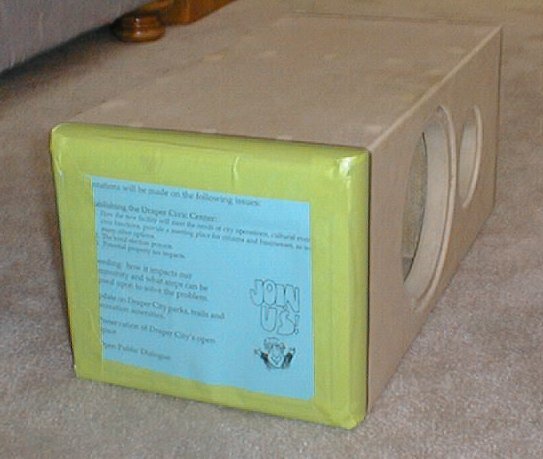 But with woofers, the cone can create some fairly large amounts of force, which are radiated into the basket and enclosure. And a 40 lb. enclosure does a lot better job of dampening those resonances than a 1/2 lb. cast aluminum basket. Anyway, I decided to use 1/8" hardboard to make my flushed-baffle board. 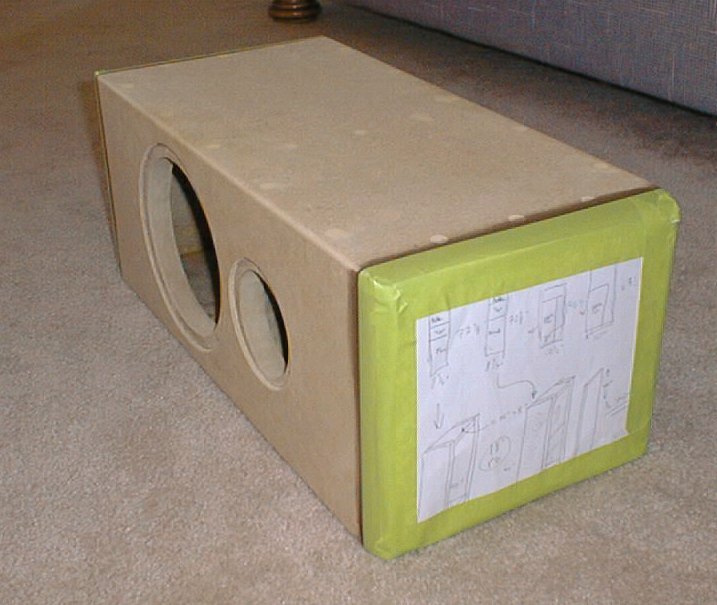 This way the woofer's gasket would just barely sit over the top, and I could easily raise the tweeter with weather stripping to the exact height of the baffle, making a seamless extension of faceplate-to-enclosure. The fact that the woofer is not totally flush mounted won't have any significant effect since it operates in a frequency range much lower than the tweeter. 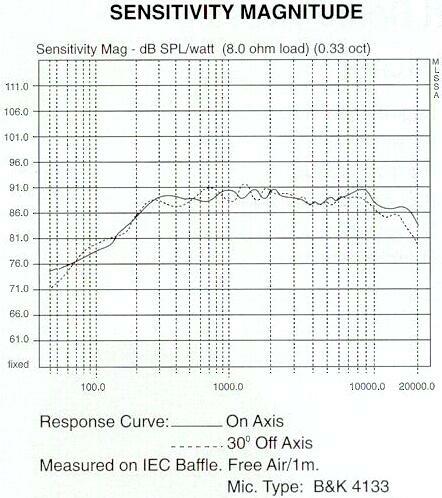 The wavelengths coming from the driver are much longer than the 1/16" overhang it has. So effectively, they (the sound waves) won't even know it exists. So with the hardboard thickness determined, I went ahead and measured the exterior dimensions of the drivers and cut my holes in the flushed-baffle board. Also using my jigsaw and cutting very carefully and very slowly. This cut is very important because it will be an exposed cut. If it's not exactly circular, you will definitely be able to see it. Also if it's too large, you will see it. I ended up cutting two baffle boards because the first one I cut was just a hair too big and I didn't like so much gap between the tweeter edge and the baffle. So the next hole cuts I made much smaller and then sanded them till the drivers slipped inside nicely, leaving just about 1/64" all the way around. Now comes the tricky part. 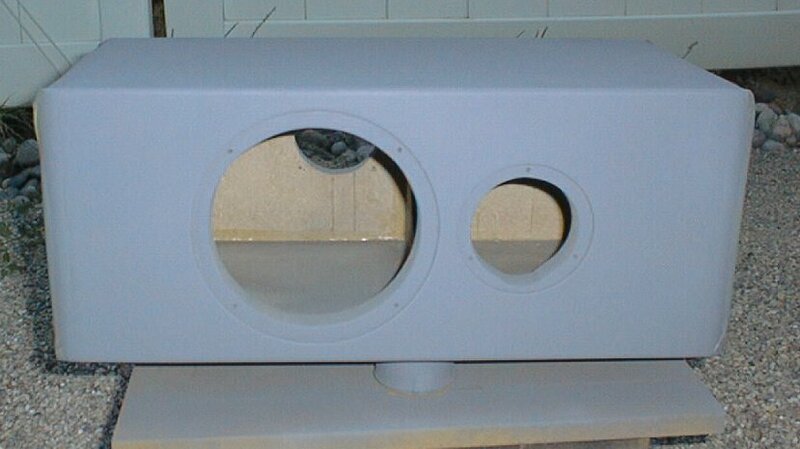 This baffle has be mounted directly over the other two holes, completely centered, and then glued into place. This is how I did it. I dropped the drivers into their respective openings, and then placed the flushed-baffle board on top. I moved the drivers around what I could, since there was some tolerance in the original cut made for them, so that they sat in place directly in the center of the exterior holes. When the 1/8" hardboard was positioned in its final resting place, drivers aligned, I nailed two small 1" finish nails into each opposite corners to hold it in place. Then I pulled out the drivers, and pulled off the hardboard making sure to leave the nails attached but sticking out so I could eventually stick them back into their holes. I covered the front baffle with Liquid Nails, and then placed the hardboard back onto the baffle, making sure to get each nail to go back into its original hole. Then I hammered them down, leaving just enough so I could pull them out later. Next I cut a small scrap piece of PB and used that to clamp down the flushed-baffled board tightly to the enclosure front. And that was that. A few hours later I pulled off the clamps, pulled out the nails and my enclosure was now complete with a 1/8" recessed cutout for each driver. And I didn't even use a router! Not only that, but my front baffle is nearly 1" thick with the extra wood. So it's stronger and more dense and helps the enclosure have a total, overall more deadness to it. Now that the front is done, it's time to work on the oak sides. This is a new technique I just picked up recently. I may have seen it on a few speakers and decided to replicate it. Wow does it look good when it's done! I took a piece of 3/4" oak veneer (not solid oak, just oak veneer, much less expensive) and cut it out to exactly 3/4" smaller than the width and height of each side. 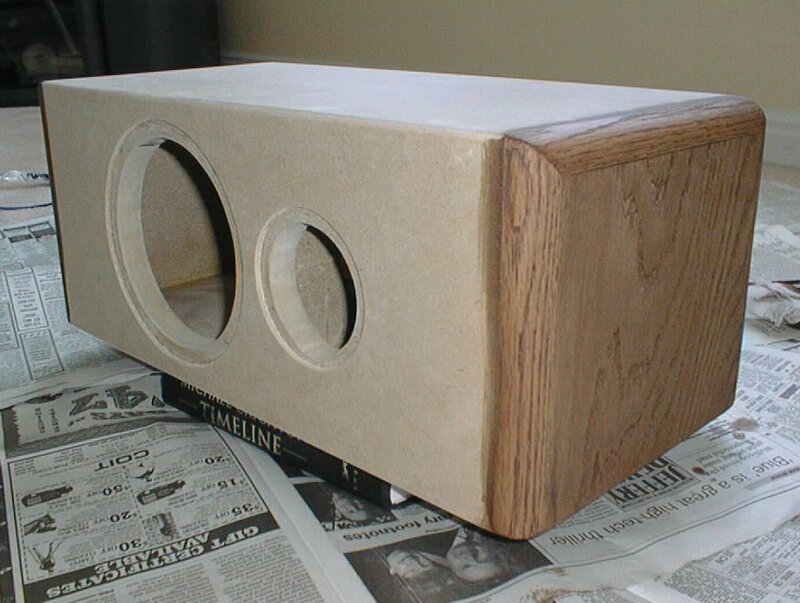 Then I used pieces of solid oak 3/4" quarter rounds to complete just the top and front of the speaker. 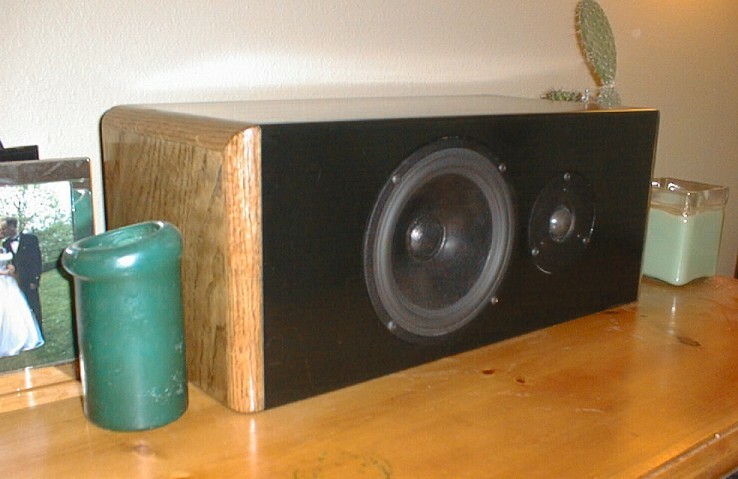 I figured with this being a center channel, the back and bottom of the speaker would never be seen, as well as for simplicity sake, I only covered the front and top with the oak quarter rounds. On my Monitor M690, I did all four sides with the oak rounds. And on my Swans M3 I plan on only doing the front with the quarter rounds. I guess I'm just mixing up the mix. Once those were are all cut, and the 45 degree angle was cut using my cheap-o miter box, it was time to glue them on. Once again I used small 1-1/2" finish nails to hold the 3/4" oak on the sides in the exact position they needed to be in before I clamped them. This did put a small hole in the nice side of wood, but with a tiny bit of putty afterwards, it's totally unnoticeable. Now I still haven't found a really good way to glue on the quarter rounds. 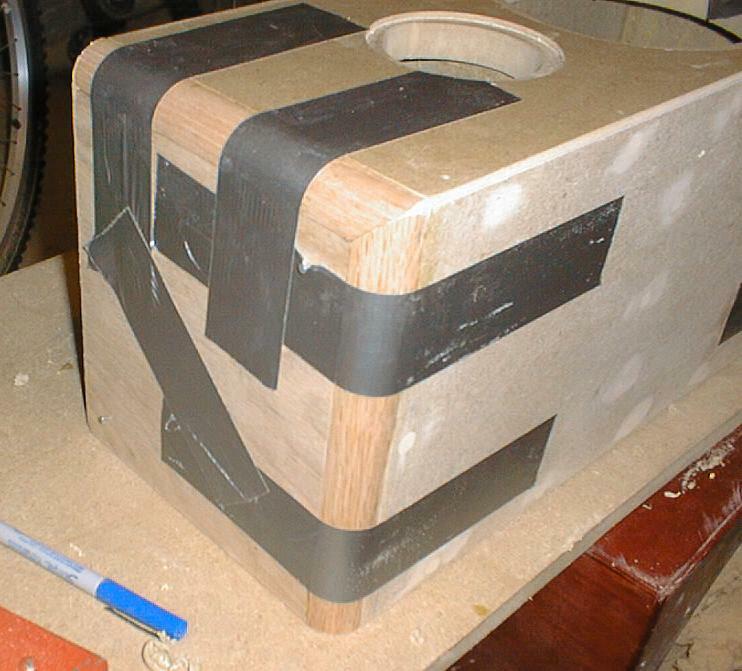 My technique to date is to use regular wood glue, place the quarter round in place and then strap duct tape from the top over the quarter round and down the other side. I've found this to work very well, as it doesn't damage any of the nice wood when you're done with it. Since the quarter rounds are mostly for aesthetics, there is no need for 100 lb. per square inch force tearing into them to get them to stay on the enclosure. They will stay on there just fine. The picture to the right shows this awesome poor-man's technique. Once the glue was all dry, I whipped out my 100, 150, and 220 sandpaper and just went to town. I sanded till my arms about fell off and sweat was dripping from every pore of my body (I suppose a 90 degree garage didn't help matters any either). Once everything was nice and smooth, I took the box inside the house to do the rest of the finish work. After all, the garage was covered in saw dust, which to this moment is probably still floating around in the air in there. Unsafe conditions for staining and painting. Oh yeah before this, I puttied up all the holes left by the screws. So up in my computer room, I was able to stain each of the sides the color I liked in a dust free environment. The stain color I chose to go with was Special Walnut by Minwax. This stuff went on so dark the first time, that I ended up only using one coat. Now that it's been finished with the clear polyurethane, it darkened up even more, so I'm glad I didn't talk myself into doing another coat (which I almost did). Once the stain dried, it was time to begin prepping for the black finish which would take care of the other 4 sides to this enclosure. So I taped the edges with a very high bond type lacquer tape. It provides a good bond without peeling up and leaves a sharp edge when your done painting. Home Depot sells it and it's actually called lacquer tape and is meant for doing exactly what I'm doing here. Along with the tape I used a couple sheets of paper to protect the rest of the newly stained wood. Now I can spray paint, brush paint, and do any kind of light sanding I need, without disrupting the stained portion of the enclosure. So first things first, a few coats of primer, with a little light sanding between and I was ready to put on the black paint. How Do You Paint Again? The paint I used in this case wasn't even a lacquer. It's not even oil based, which I thought it was originally, until I dipped my used paint brush into a bowl of paint thinner and nothing happened. Okay so I'm a little slow in some areas. Painting never has been my forte. It turns out to just be a generic water based style paint intended for around the house crafts and hobbies like chairs, doors, kids toys and furniture. Well I guess you could fit speakers into the list. At any rate, the stuff worked out great! It's thick as all snot, but brushed on smooth and dried very quickly. Much quicker than any lacquer. My paint brush wasn't the greatest however so it did leave a few brush strokes. But after it dried I sanded those out with 220, and put on another coat, somewhat thicker than the last trying to leave less brush strokes. I think I succeeded. After 2 coats, I was happy with the finish and was ready to do Dan's patented final finish. I sanded the last coat with 400 till it was nice and smooth. There were a few brush strokes, but I knew they'd be gone by the time I was done with the next step. 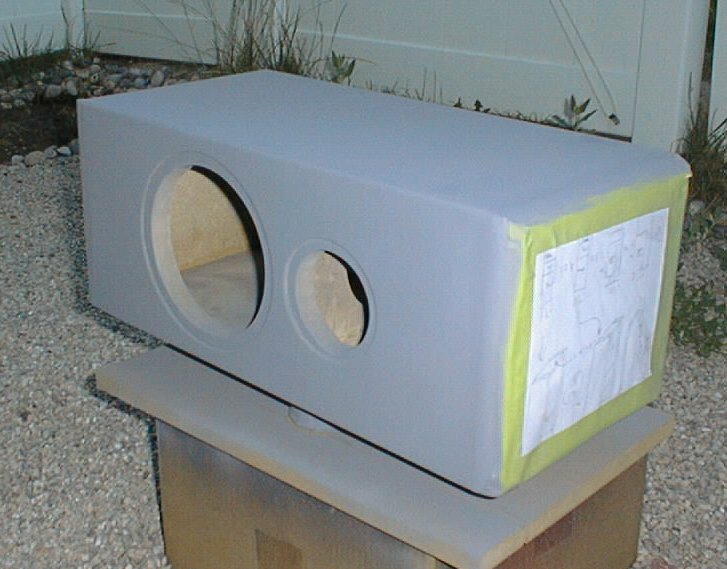 This is where I whip out the ole spray paint and spray the entire enclosure over three or four coats till it's as black and as smooth as can be. 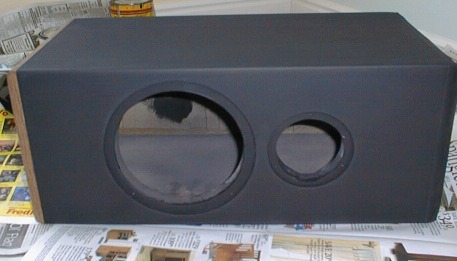 So spray paint is my patented second to final coat. I think it works great, and it literally takes out all of the flaws the brush leaves behind. Well, my brush anyways. 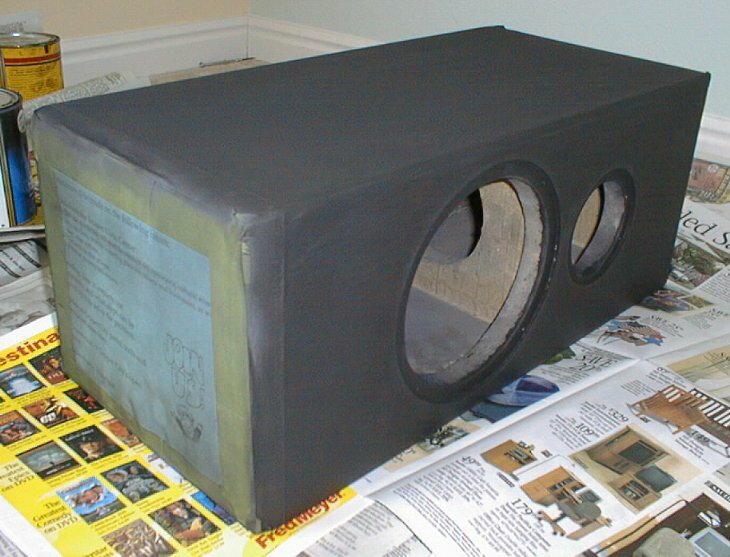 After the spray paint dries, you're left with a somewhat grainy feeling on the speaker. I remove this with just a sheet of ordinary computer paper. It acts as a very fine sandpaper and removes all the little grainy spray paint residue. It's so fine in fact that it will turn your hands black with a fine black powder that is so fine you have to wash your hands with soap and water to get it off. It's almost like black toner from a copy machine or printer. Well now that the black finish is complete, I can take off the green tape and expose once again the beautiful dark oak stain below. 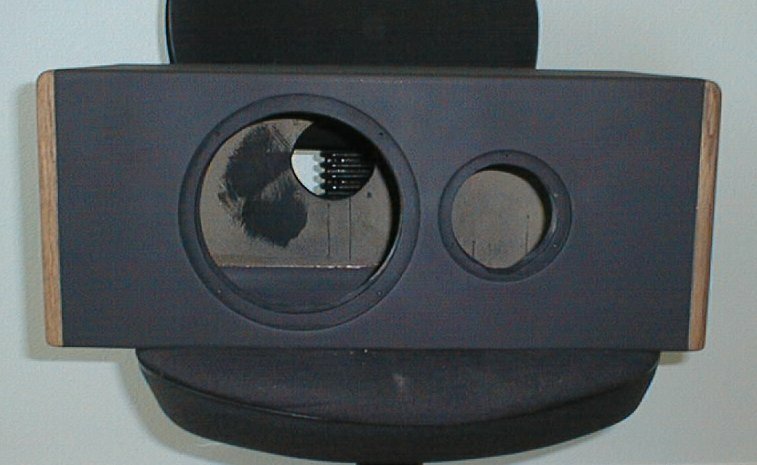 This is where you will get your first glance at the final beautiful overall finish of the speaker. Where the dark satin black meets the the deep brown oak, it just looks awesome. But not as awesome as it will look once the whole thing has been painted with several coats of a clear polyurethane. That's the stage I am at right now. I've got one coat on and 2 more to go. Between coats I let it dry about 5-6 hours before I will sand it with 220, and redo again. 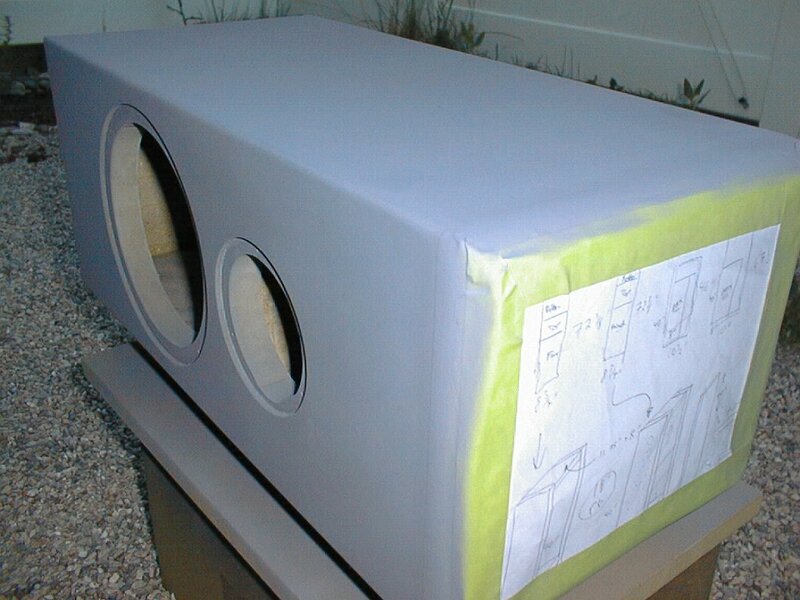 The final coat requires 24 hours before light use and 72 hours before heavy use. And that's it it! Next I will discuss the new crossover I will be implementing and show off the final pictures. Until then! The speaker is done and I finally got the finished pictures! I was borrowing the camera from a friend and he's been using it to take some pictures of stuff to sell on e-Bay. So I borrowed it again and took the final three pictures. My first impressions? Wow, this speaker looks amazing. This is the most beautiful speaker I have made to date. Yes, I impressed myself. Hard to do, because I'm such a perfectionist in areas such as this. So I spent 5 days straight on just the finish alone. It got as good as I could get it and I left it at that. I ended up doing so many coats of the satin polyurethane, with so much sanding between, that the finish actually ended up being glossy. Not super glossy, but definitely not satin. I still like it though. I even like it better glossy. The finish is very, very smooth all the way around and has a good deal of depth to it. 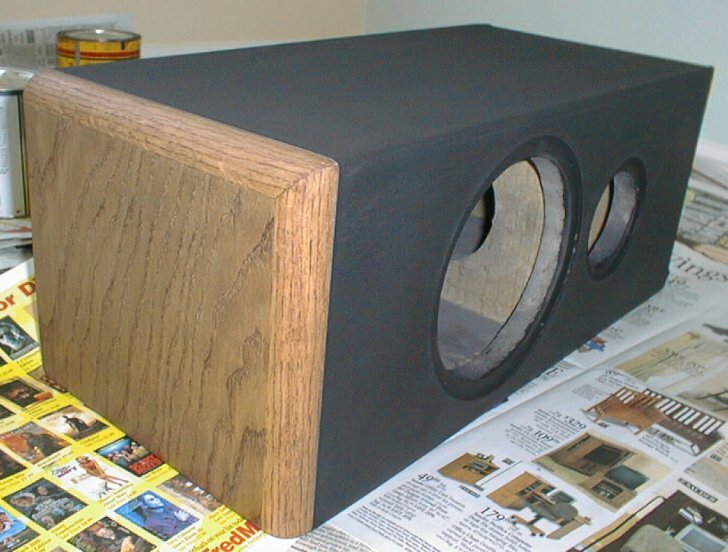 In my effort to sand out the brush strokes (reverting back to 150 sandpaper on my nice black finished speaker), I did manage to sand out all the paint brush strokes to the point that they were very, very small. So small that they longer looked like brush strokes. But then moving onto 220 sandpaper, I had a hard time removing the markings left form the 150 without going all the way through the original coats of paint to bare wood. So I was left with these very thin lines, like scratches on the surface of the black paint. 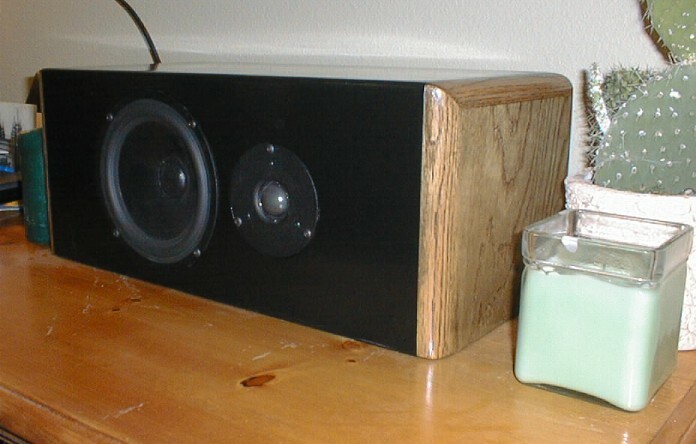 Now with the polyurethane on top, it actually becomes buried into the finish and barely noticeable, yet it gives a lot character to the speaker. The result can only be seen under certain light and at certain angles. It just screams out at you, "Many long, hard hours went into my production!" Otherwise, the finish looks flawless. I actually prefer this look to just buying a sheet of boring high gloss black Formica and gluing it on the top. Call me old fashioned. 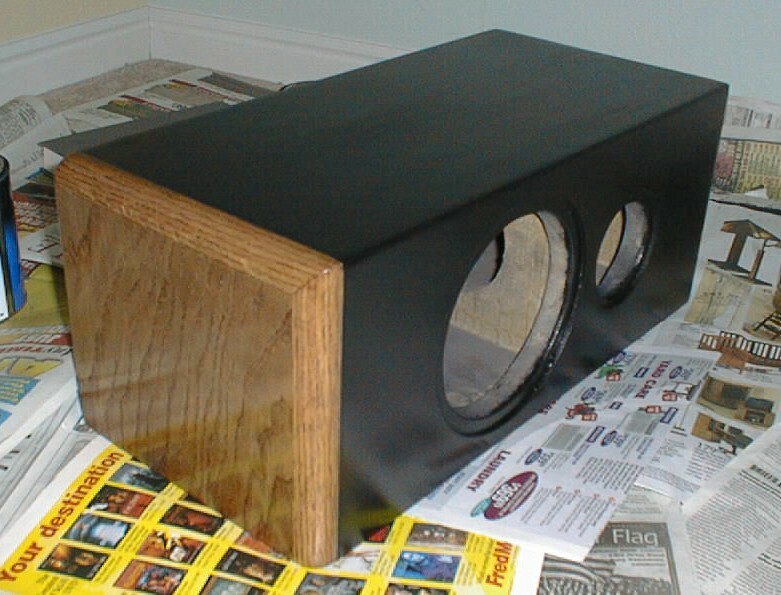 I finished off the speaker with a few sprays of that Howard's Orange Oil Furniture Polish. It basically gives the wood a glossy, new, very slick feel to it and takes out most of the finger prints which easily build on the surface. Now for the sound, I popped in Gladiator and watched a few scenes. Now since I'm a married guy living with neighbors on either side of me who are also married and have kids and stuff, I never get the opportunity to play movies very loud. I respect other people's right to have a peaceful, happy home as I like my home to be. So it's hard to give a really good review. 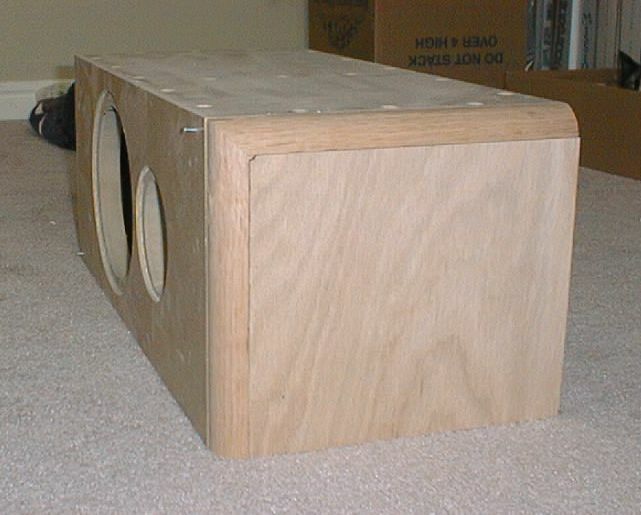 It does sound much fuller in the low end, since the enclosure is larger than the previous one. I believe I'm very close to a Qtc of 0.71. There are no air leaks whatsoever. The inside walls are lined with egg crate foam and the enclosure is 100% filled with a pollyfill type batting. The kind your wife buys at the craft store. So the midrange still sounds very smooth and uncolored. The cabinet almost has no resonances. If you place your hands on the cabinet when Russell Crowe talks, there is very little to none vibration artifacts. I noticed the treble sounds a bit different. It is perfectly flush mounted (which looks awesome) so I assume that's what is accounting for the tonal difference, but I can't make out what it is just yet. I almost think I need to pad it 1-2 dB. It feels a hair brighter than it used to be. It also could have been the DTS audio track on that movie. I know it's a bright one. I also have plans to re-do the crossover once again. I like the new 12 dB L-R one that I crudely constructed to replace the old 6 dB one, but my inductor values are guestimated and poorly wound. They have high DCR values and my caps are standard electrolytes. I want to rebuild it with all 18 gauge air core inductors, polypropylene caps, 14 gauge silver plated internal speaker wire, and drop the x-over frequency to 1950 Hz, which will make for standard values for L-R design. Then I think I will be officially done! You think? This next little portion I'm dedicating to the, "How I wished I'd done it." section. Tips on how I could have done it better and what I have learned from doing it wrong. "Measure twice, cut once". I love this one. It's a classic saying but you can't go without. I made at least three bad cuts that caused me to have to toss good wood for scrap. 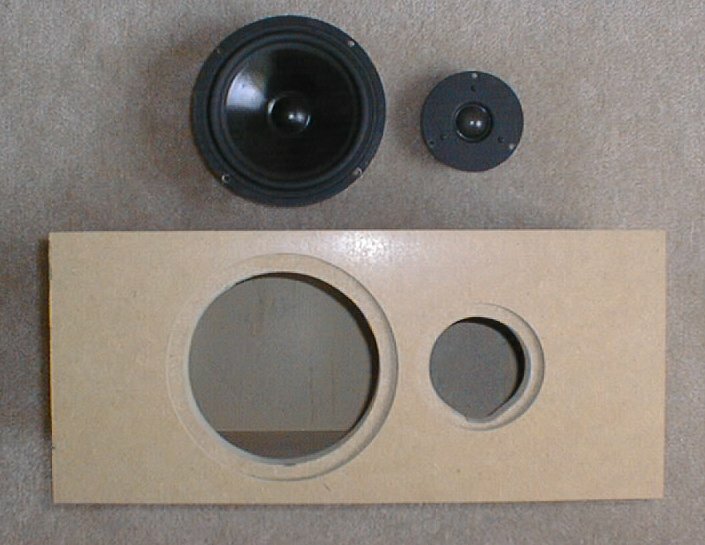 Granted it was a small speaker, so not much was wasted, it is frustrating to go try and pop and piece of wood in place and find you cut the short side even shorter instead of the longer side to fit just right. I also mounted the terminal cup off center towards the top instead of off center towards the bottom how I wanted it. Now I measure 27 times and cut just once. "Don't take off the lacquer tape before you've completed all the sanding on the lacquer." Once my paint dried I was so anxious to see what it looked like in contrast with the stained oak, that I tore right off the tape and paper protector. I ooooed and aaaaawed at how cool it all looked. The seam from black to stain was perfect. Then I started sanding away at that newly dried paint and, well remember how I said it left such a fine powder it was like toner from a printer? Well it works in the same manner too. I ended up getting that fine black powder inside the tiny cracks of grain in my oak (just on the top) and no amount of blowing inside there was getting it out. It was very subtle but it did tend to darken up the overall look of the brown stain in a couple of spots. Lucky for me I had chosen such a dark stain to begin with. Any lighter a color could have easily been ruined. So keep that in mind! The only hard part is sanding the paint without tearing up the edges of the tape. That's it for now. I know I have more stupid lessons to be learned, but this is all I can write at this time.